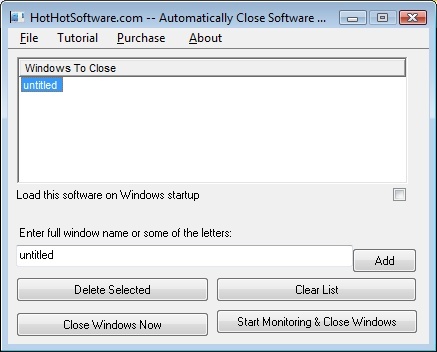 Automatically Close Software Windows Close Programs and Close Popups Software! Get it now! Only $29.95 U.S. (Regular $49.95 US!) for a limited time! 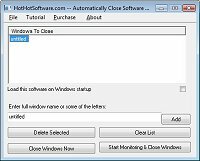 Specify full or partial window titles to close Using this software, you would simply enter the title of the window that would popup (which works for windows applications as well). Useful if you need to close multiple windows at once, automatically close multiple programs at once, system monitoring (closing of applications), or more! Download this software now, and see how easy it is is to automatically close a number of different application windows by title at once!